Proudly posing with works at Appleridge. It is always intriguing to see which works Jesse and Lin Gardner choose to include in their "Director's Choice" exhibition. My work entitled "Reunion" will be part of those works selected and I am thrilled to have it included. I decided to paint a huge encaustic painting using embedded watercolor images and photos taken by my photographer / welder husband, Noel Sylvester. I tore the photos, added tinted encaustic waxes to create fog and the sense of perspective. 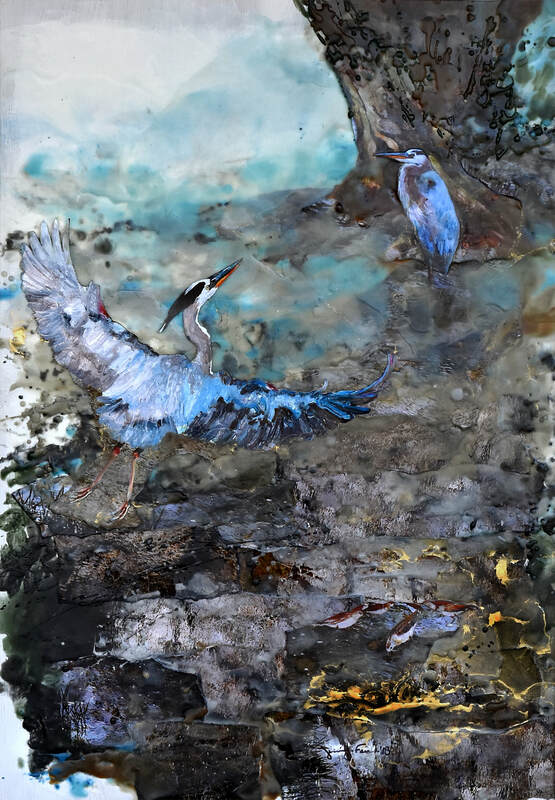 My flying heron painting was just the same perspective as a wonderful river photograph so the overlay looks very convincing. Hoping you will enjoy the textures and the surprise birds that are embedded there. 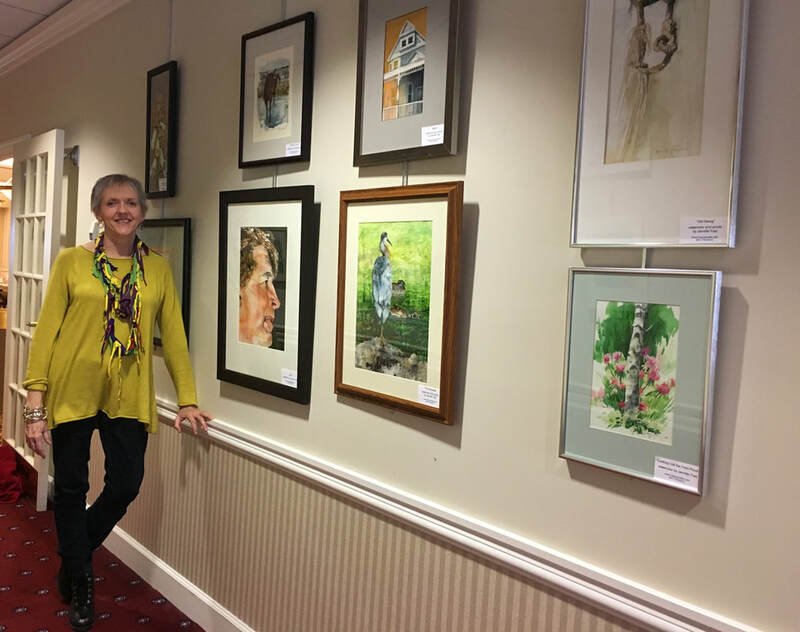 I have rejoined the Elmira Regiona Art Society after a long hiatus, and am pleased to be part of a four artist display at Appleridge Senior Living Community. Fellow exhibitors include Chris Thorborg, Rob Thorborg and Valerie Brand. Thirty pieces of sculpture and painting are on exhibit near the main dining hall from now through the end of April. 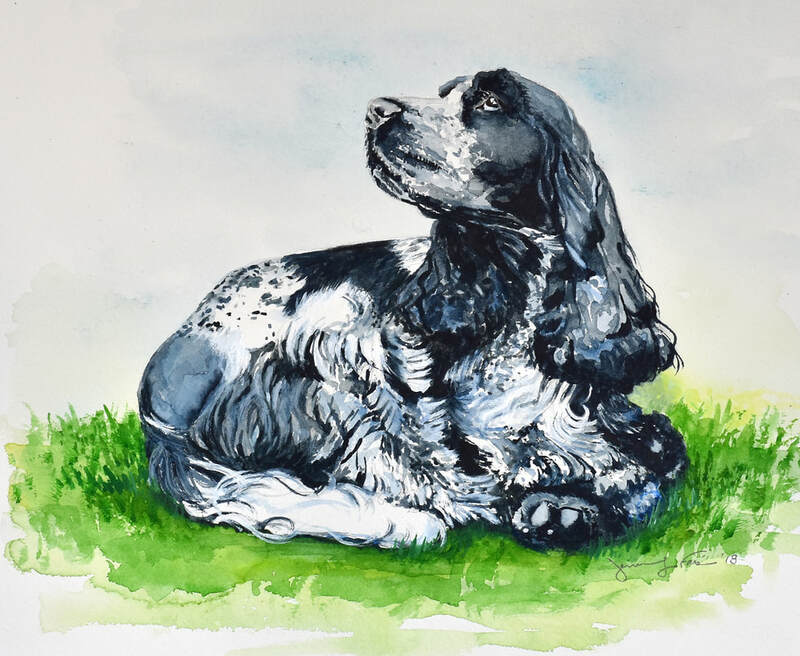 A House / pet Portrait - always a nice gift. Looking for a gift for that person who has everything? I bet they don't have a portrait of their home.......yet! OR, a portrait of their favorite pet!